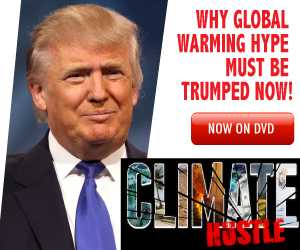 Marc Morano, a former Republican political aide who distributes a newsletter questioning climate science, said that for years, non-scientists like Al Gore and Leonardo DiCaprio were given generous media time and demanded climate action from the government. "Now that we have a president who is a climate skeptic, suddenly the left only believes that scientists who agree with the U.N.'s climate views are qualified to speak about global warming," Morano said. Marc Morano, publisher of Climate Depot and Author of new 2018 book, The Politically Incorrect Guide to Climate Change. & Former Senior Staff of the U.S. Senate Environment & Public Works Committee: "I have often joked that I am not a scientist, but I often play one on TV. But the idea that non-scientists can't discuss and have views on climate change is contrary to everything the climate activists have pushed for years. The idea of a "97% consensus" was pushed so that non-scientists who support climate regulations could claim that the "science was settled' and there was "no more debate" on the topic. For decades, non-scientists like Al Gore, Bill Maher, President Obama, Tom Steyer and Leonardo DiCaprio were given generous media time to push the "settled" climate science claims and demand climate "action" from the government. Now that we have a President who is a climate skeptic and who is dismantling the Left's climate agenda, suddenly the Left only believes that scientists who agree with the UN's climate views are qualified to speak about global warming." Rep.-elect Alexandria Ocasio-Cortez (D-N.Y.), who has pushed a “Green New Deal” on Capitol Hill, fueled the social media debate by slamming conservatives who have used the phrase on television to question climate science. Ocasio-Cortez’s criticism, which was repeated on social media by Sen. Brian Schatz (D-Hawaii), climate scientists, journalist Dan Rather and political organizations, suggests it could be a renewed talking point from the left. “Has anyone else noticed that ‘I am not a scientist’ is the new cliché prelude for lobbyists & fossil fuel interests to slip in climate denial pseudoscience on live television?” Ocasio-Cortez asked. Her comment was retweeted more than 6,000 times. “Now that we have a president who is climate skeptic, suddenly the left only believes that scientists who agree with the U.N.’s climate views are qualified to speak about global warming,” Morano said.